Public free school for poor and orphaned boys, who are there given an elementary education in Hebrew, the Scriptures (especially the Pentateuch), and the Talmud (Halakah), and are thus prepared for the Yeshibah. The Talmud Torah school is known simply as the Talmud Torah, and has the essential elements of the Ḥeder, the latter being a private self-supporting school. In the remotest time of Jewish history the father was the sole teacher of his children (Deut. xi. 19). The institution known as the "be rab" or "bet rabban" (house of the teacher), or as the "be safra" or "bet sefer" (house of the book), is supposed to have been originated by Ezra and his Great Assembly, who provided a public school in Jerusalem to secure the education of fatherless boys of the age of sixteen years and upward. But the school system did not develop till Joshua ben Gamla the high priest caused public schools to be opened in every town and hamlet for all children above six or seven years of age (B. B. 21a). Strict discipline was observed. Rab, however, ordered Samuel b. Shilat to deal tenderly with the pupils, to refrain from corporal punishment, or at most to use a shoe-strap in correcting pupils for inattention. A stupid pupil was made monitor until able to grasp the artof learning. Raba fixed the number of pupils at twenty-five for one teacher; if the number was between twenty-five and forty an assistant teacher ("resh dukana") was necessary; and for over forty, two teachers were required. The expense was borne by the community. There is a difference of opinion regarding the qualification of the "melammed" (teacher). Raba preferred one who taught his pupils much, even though somewhat carelessly, while R. Dimi of Nehardea preferred one who taught his pupils little, but that correctly, as an error in reading once adopted is hard to correct (ib.). It is, of course, assumed that both qualifications were rarely to be found in one person. Only married men were engaged as teachers. Girls were invariably excluded from the Talmud Torah, first because teaching them is not obligatory, and second because they are "light-minded." R. Eliezer said: "Whosoever teaches his daughter the Torah is as one who teaches her frivolity" (Soṭah 21b). Maimonides, however, held that the prohibition refers to the Talmud, and not to the Bible ("Yad," Talmud Torah, i. 13). Girls were mostly taught privately, and received a fair education. The teaching in the Talmud Torah consumed the whole day, and in the winter months a few hours of the night besides. Teaching was suspended in the afternoon of Friday, and in the afternoon of the day preceding a holy day. On Sabbaths and holy days no new lessons were assigned; but the work of the previous week was reviewed on Sabbath afternoons by the child's parent or guardian (Shulḥan 'Aruk, Yoreh De'ah, 245). The Talmud Torah did little for the religious teaching and training of the pupils; this was left to parents or guardians. The main object of the early schools was to instruct the pupil in the laws of Moses and in the knowledge of the rabbinical writings, more from a literary than from a practical standpoint. In later times, influenced in a measure by the Christian parochial schools of the thirteenth century, the reading of the prayers and benedictions and the teaching of the principles of the Jewish faith were included. 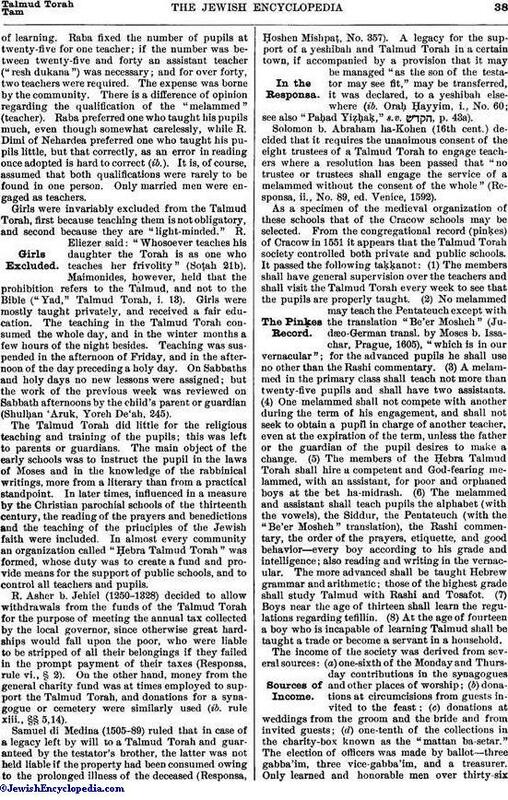 In almost every community an organization called "Ḥebra Talmud Torah" was formed, whose duty was to create a fund and provide means for the support of public schools, and to control all teachers and pupils. R. Asher b. Jehiel (1250-1328) decided to allow withdrawals from the funds of the Talmud Torah for the purpose of meeting the annual tax collected by the local governor, since otherwise great hardships would fall upon the poor, who were liable to be stripped of all their belongings if they failed in the prompt payment of their taxes (Responsa, rule vi., § 2). On the other hand, money from the general charity fund was at times employed to support the Talmud Torah, and donations for a synagogue or cemetery were similarly used (ib. rule xiii., §§ 5,14). Samuel di Medina (1505-89) ruled that in case of a legacy left by will to a Talmud Torah and guaranteed by the testator's brother, the latter was not held liable if the property had been consumed owing to the prolonged illness of the deceased (Responsa, Ḥoshen Mishpaṭ, No. 357). A legacy for the support of a yeshibah and Talmud Torah in a certain town, if accompanied by a provision that it may be managed "as the son of the testator may see fit," may be transferred, it was declared, to a yeshibah elsewhere (ib. Oraḥ Ḥayyim, i., No. 60; see also "Paḥad Yiẓḥaḳ," s.v. , p. 43a). Solomon b. Abraham ha-Kohen (16th cent.) decided that it requires the unanimous consent of the eight trustees of a Talmud Torah to engage teachers where a resolution has been passed that "no trustee or trustees shall engage the service of a melammed without the consent of the whole" (Responsa, ii., No. 89, ed. Venice, 1592). As a specimen of the medieval organization of these schools that of the Cracow schools may be selected. From the congregational record (pinḳes) of Cracow in 1551 it appears that the Talmud Torah society controlled both private and public schools. It passed the following taḳḳanot: (1) The members shall have general supervision over the teachers and shall visit the Talmud Torah every week to see that the pupils are properly taught. (2) No melammed may teach the Pentateuch except with the translation "Be'er Mosheh" (Judæo-German transl. by Moses b. Issachar, Prague, 1605), "which is in our vernacular"; for the advanced pupils he shall use no other than the Rashi commentary. (3) A melammed in the primary class shall teach not more than twenty-five pupils and shall have two assistants. (4) One melammed shall not compete with another during the term of his engagement, and shall not seek to obtain a pupil in charge of another teacher, even at the expiration of the term, unless the father or the guardian of the pupil desires to make a change. (5) The members of the Ḥebra Talmud Torah shall hire a competent and God-fearing melammed, with an assistant, for poor and orphaned boys at the bet ha-midrash. (6) The melammed and assistant shall teach pupils the alphabet (with the vowels), the Siddur, the Pentateuch (with the "Be'er Mosheh" translation), the Rashi commentary, the order of the prayers, etiquette, and good behavior—every boy according to his grade and intelligence; also reading and writing in the vernacular. The more advanced shall be taught Hebrew grammar and arithmetic; those of the highest grade shall study Talmud with Rashi and Tosafot. (7) Boys near the age of thirteen shall learn the regulations regarding tefillin. (8) At the age of fourteen a boy who is incapable of learning Talmud shall be taught a trade or become a servant in a household. The income of the society was derived from several sources: (a) one-sixth of the Monday and Thursday contributions in the synagogues and other places of worship; (b) donations at circumcisions from guests invited to the feast; (c) donations at weddings from the groom and the bride and from invited guests; (d) one-tenth of the collections in the charity-box known as the "mattan ba-setar." The election of officers was made by ballot—three gabba'im, three vice-gabba'im, and a treasurer. Only learned and honorable men over thirty-sixyears of age were eligible for election. The taḳḳanot regulating these sources of the Talmud Torah's income were in existence in the time of R. Moses Isserles. R. Joel Sirkes, rabbi of Cracow in 1638, indorsed these regulations and added many others, all of which were confirmed at a general assembly of seventy representatives of the congregations on the 25th of Ṭebet, 5398 (1638; F. H. Wetstein, "Ḳadmoniyyot," document No. 1, Cracow, 1892). The Talmud Torah organization in Rome included eight societies in 1554, and was reconstituted Aug. 13, 1617 (Rieger, "Gesch. der Juden in Rom," p. 316, Berlin, 1895). Later, certain synagogues assumed the name "Talmud Torah," as in the case of one at Fez in 1603 (Ankava, "Kerem Ḥemed," ii. 78, Leghorn, 1869) and one at Cairo. This was probably because the school was held in or adjoined the synagogue. The Sephardim conducted their schools more methodically. The one in Amsterdam was highly praised by R. Sheftel b. Isaiah Horowitz ("Wawe ha-'Ammudim," p. 9b, appended to "Shelah," Amsterdam, 1698). Shabbethai Bass, in the introduction to his "Sifte Yeshanim" (p. 8a, ib. 1680), describes this Talmud Torah and wishes it might serve as a model for other schools. He says: "It is built near the synagogue, and has six rooms, each accommodating a separate class under a melammed. The first class is for small boys who are learning to read their prayers. In the second class they learn the Pentateuch from beginning to end, with the musical accents. In the third, they translate the Pentateuch into the vernacular and use the Rashi commentary, divided into the regular weekly sidrot. In the fourth, they learn the Prophets and the Hagiographa, with the proper accents and translation. In the fifth, they learn grammar and begin upon a series of halakic excerpts from the Talmud, the text being in Hebrew and the explanations in the vernacular. Before the approach of a holy day they memorize the laws in the Shulḥan 'Aruk pertaining to that holy day. The sixth class is preparatory to the yeshibah in the bet ha-midrash and is conducted by the ḥakam-rabbi. In this class every day one halakah, with the commentaries of Rashi and the Tosafot, is studied, and compared with the conclusions in the codes of Maimonides, Asheri, and Caro. The hours of study are from 8 to 11 in the morning, and from 2 to 5 in the afternoon; in winter, till the Minḥah prayer. The expense of maintaining this school is defrayed from a fund contributed by the members of the Ḥebra Talmud Torah. This Sephardic school made an exception to the rule of keeping the pupils in Talmud Torah all day, and a few hours of the night in the short winter days." The Talmud Torah at Nikolsburg, Moravia, from 1724 to 1744, gave poor boys an education equal to that which was offered their more fortunate companions. The studies consisted of Siddur, Ḥumesh (Pentateuch), and Talmud (Güdemann, "Quellenschriften zur Gesch. des Unterrichts und der Erziehung bei den Deutschen Juden," p. 275). The schools in eastern Europe retained the ancient type and methods of the Ashkenazic schools up to the middle of the nineteenth century, when a movement for improvement and better management took place in the larger cities. Thus at Odessa, in 1857, the Talmud Torah, which had existed ever since the city was chartered, was reorganized into a model school by distinguished pedagogues. In 1881 S. J. Abramowitch was appointed principal over 400 pupils. In 1904 two branches were opened in the suburbs with an additional 400 pupils. The boys are furnished text-books and clothing free. The expenses are about 20,000 rubles annually. There is a Talmud Torah in every city within the Pale in Russia. The income is derived from the Jewish tax on meat and from private contributions. In Jerusalem the Talmud Torah of the Sephardim, called "Tif'eret Yerushalayim," was reorganized by the ḥakam bashi R. Raphael Meïr Panejil in 1891, with 300 pupils and 13 teachers; there the boys learn Arabic and arithmetic in addition to other subjects, which range from the alphabet to the Talmud. The time of study is from sunrise to sunset. The largest contributions for the support of the school come from the Sassoons in Bombay and Calcutta, through the meshullaḥim. The Ashkenazic Talmud Torah and yeshibah 'Eẓ Ḥayyim, with 35 teachers and over 1,000 pupils, succeeded the school established by R. Judah he-Ḥasid of Siedlce. It was started with a fund contributed by Hirsch Wolf Fischbein and David Janover in 1860. The annual expenditure is about $10,000, over half of which is collected in the United States. At Jaffa the Talmud Torah and yeshibah Sha'are Torah was organized in 1886 by N. H. Lewi, with 9 teachers and 9 classes for 102 boys. Its expenses are about $2,000 yearly, mostly covered by donations from abroad. 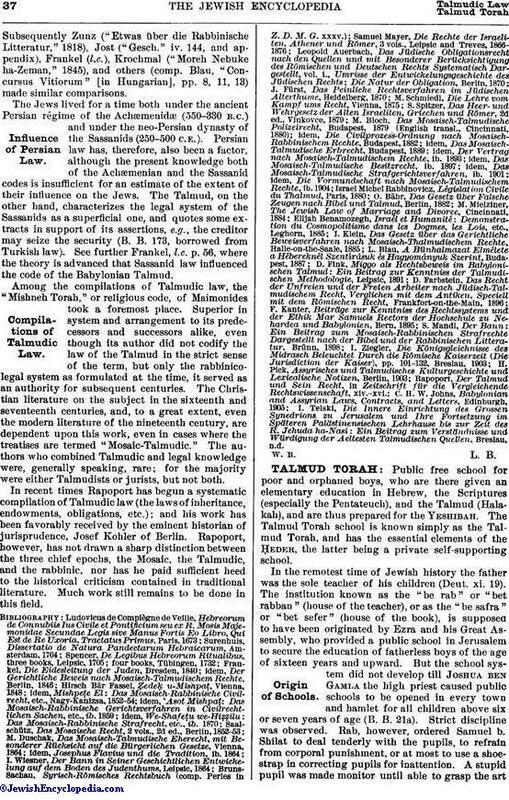 In America the Machzikei Talmud Torah in New York was organized in 1883 by Israel (Isidor) Rosenthal. It maintains schools on its own premises at 225-227 East Broadway. It instructs over 1,100 boys at a yearly expense of about $12,000. On Jan. 22, 1905, the society opened a branch at 67 East 7th street, to which Jacob H. Schiff donated $25,000. The society is managed by a board of directors and a committee of education. The studies comprise elementary Hebrew, the reading of the prayers, the translation of the Pentateuch into Yiddish and English, and the principles of the Jewish faith and practise. The time of study occupies only two hours per day, after public-school hours, as all pupils attend the city schools for secular education. There are several other Talmud Torahs in New York; and similar institutions exist in all cities of the United States and Canada that have a large Jewish population. See Education; Ḥeder; Pedagogics; Yeshibah. Brandstädter, sketch in Ha-Eshkol, v. 70-84.